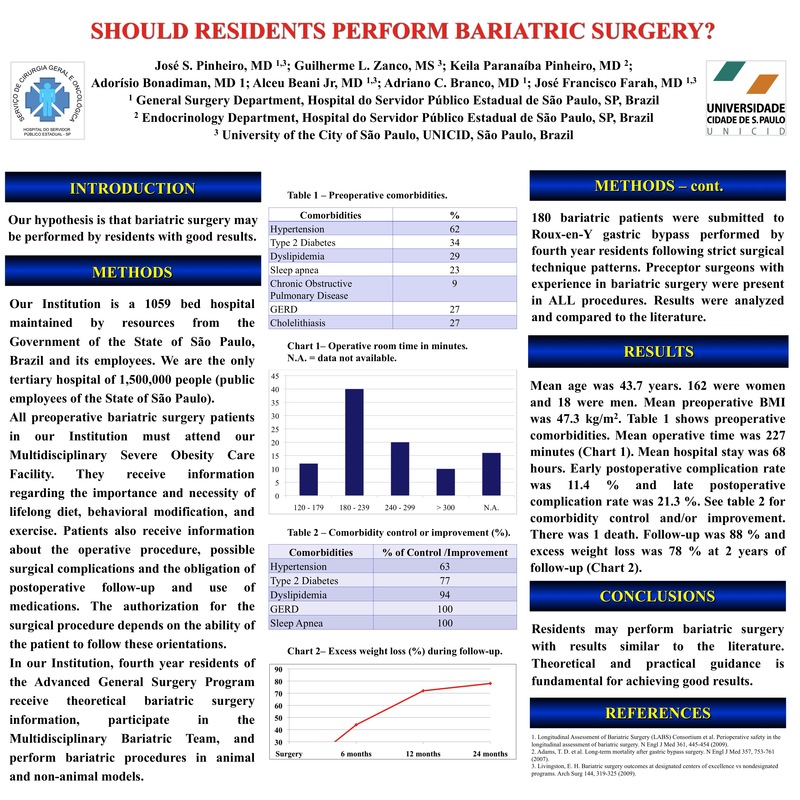 Should Residents Perform Bariatric Surgery? Introduction: Our hypothesis is that bariatric surgery may be performed by residents with good results. Methods and Procedures: In our Institution, fourth year residents of the Advanced General Surgery Program receive theoretical bariatric surgery information, participate in the Multidisciplinary Bariatric Team, and perform bariatric procedures in animal and non-animal models. 180 bariatric patients were submitted to Roux-en-Y gastric bypass performed by fourth year residents. Preceptor surgeons with experience in bariatric surgery were present in all procedures. Results were analyzed and compared to the literature. Results: Mean age was 43.7 years. 162 were women and 18 were men. Mean preoperative BMI was 47.3kg/m². Mean operative time was 227 minutes. Mean hospital stay was 68 hours. Early postoperative complication rate was 11.4% and late postoperative complication rate was 21.3%. There was 1 death. Follow-up was 88% and EWL was 78% at 2 years of follow-up. Results: Residents may perform bariatric surgery with results similar to the literature. Theoretical and practical guidance is fundamental for achieving good results.